Can you say WOWOW! Unreal vintage warm tone in a modern playable format! Hand crafted! 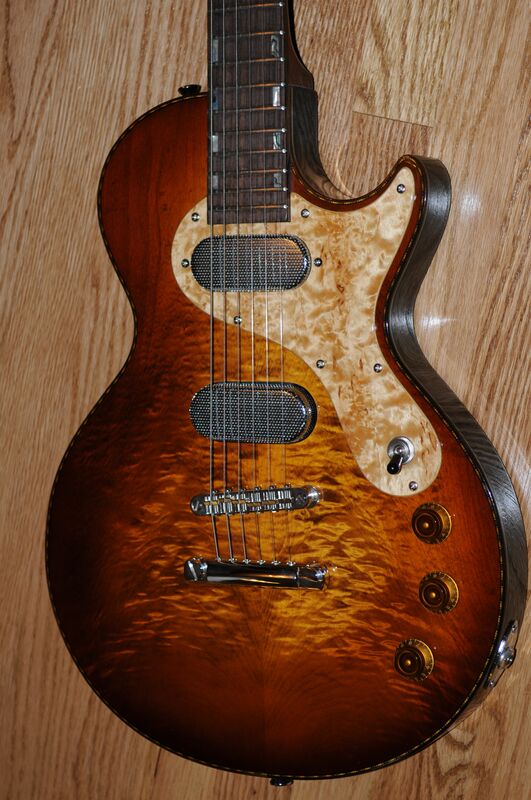 $6700 elsewhere this will save you $2k on a guitar most would pass for new. Just 6lbs-5oz. Finnish Alder, Aspen & Maple Neck. Hand crafted Versoul Pickups! NO fret wear & no dings. See the spec/condition sheet with all the details. 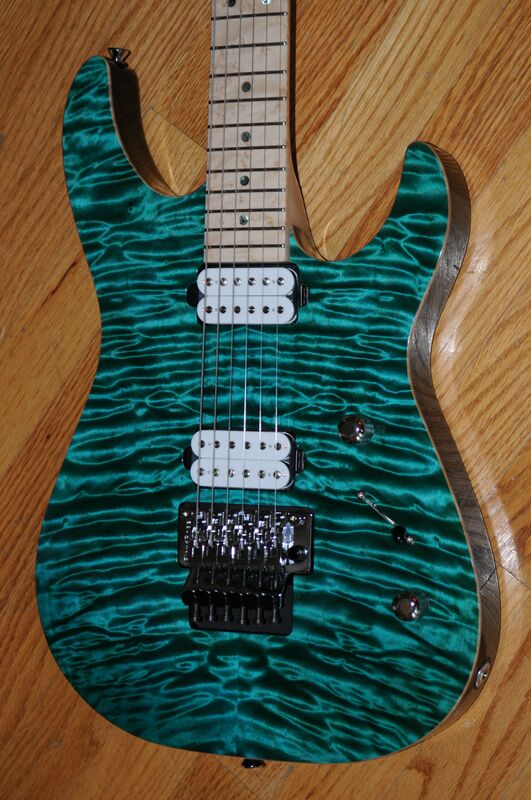 2013 James Tyler Studio Elite HD in Hazmat Schmear…..mmmm…Semi-Gloss (my fave). 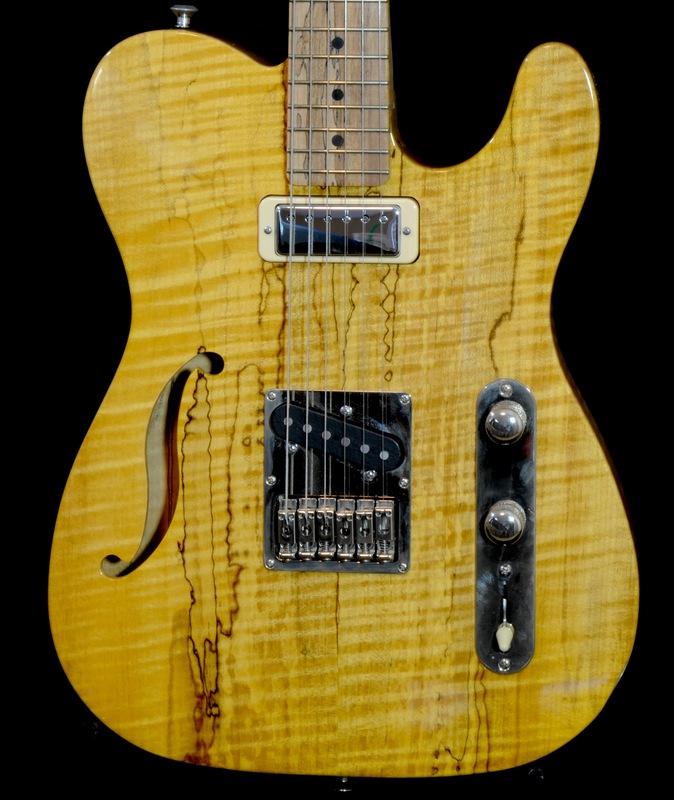 Love the Quartersawn Maple Neck. 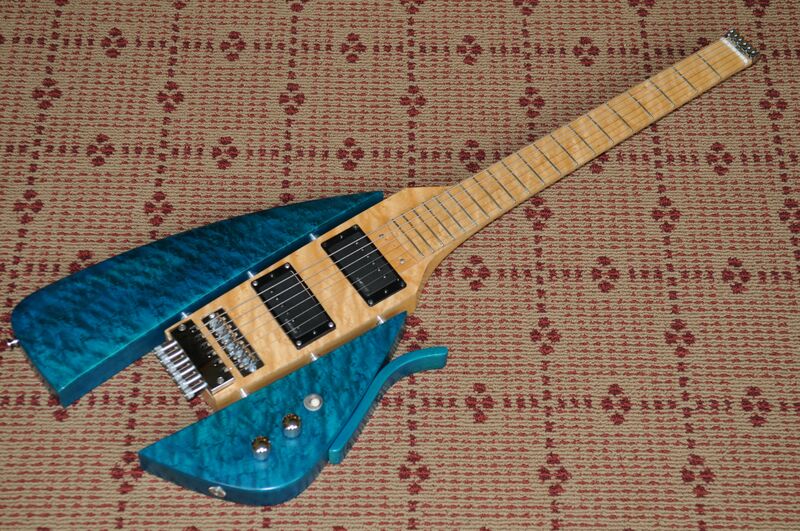 Love the compound radius and heavy frets. Adore the delicious slightly scalloped board edges. Just 7lb-10oz & comes with the original case and Spec Sheet. 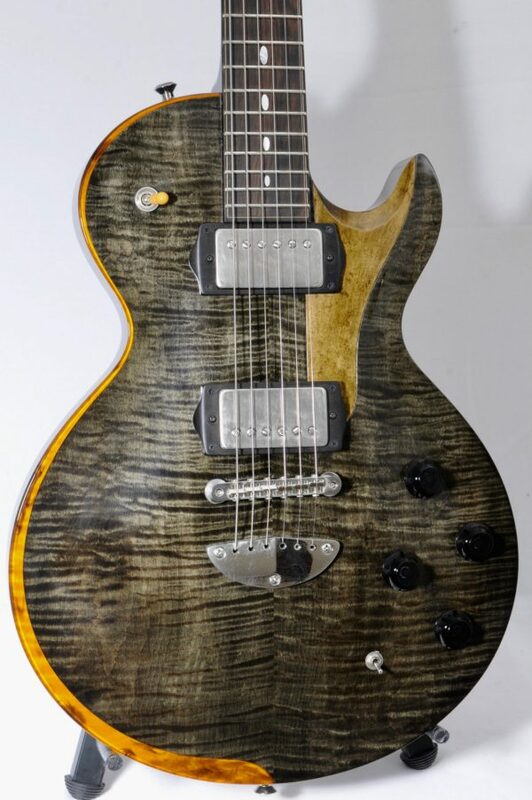 These guitars are mid-$5ks now…wow…save a bundle on a clean nonsmoking instrument that has plenty of good notes left in it. Quilt Hall-o-Fame isn’t it! 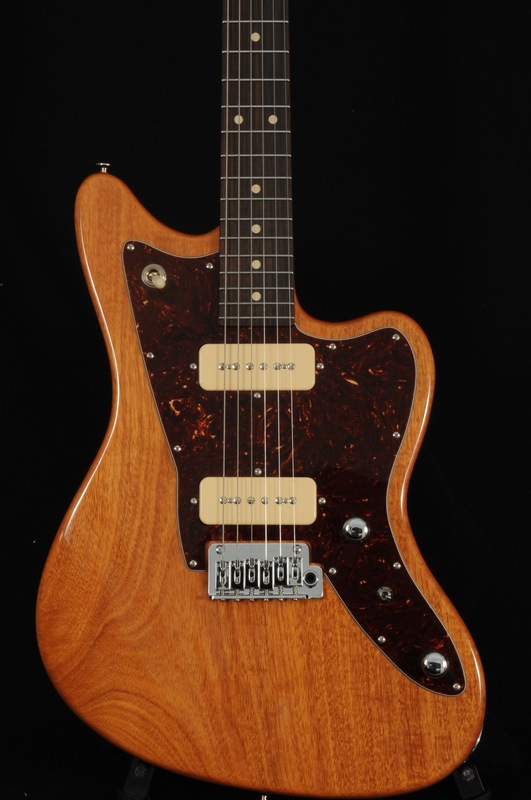 But wait…check out the birdseye maple neck & board! Mint “-” Condition with no fret wear & no dings. Even has GOLD FRETS! 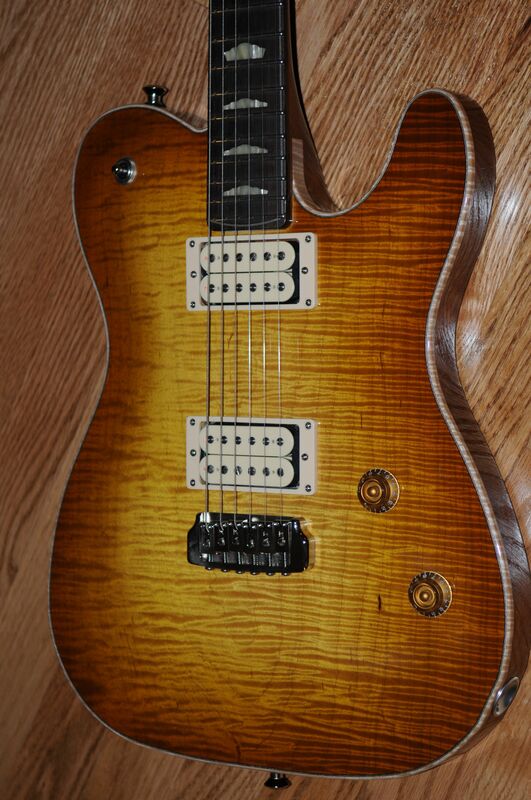 Nice C profile neck with that satin finish that feels broken in. 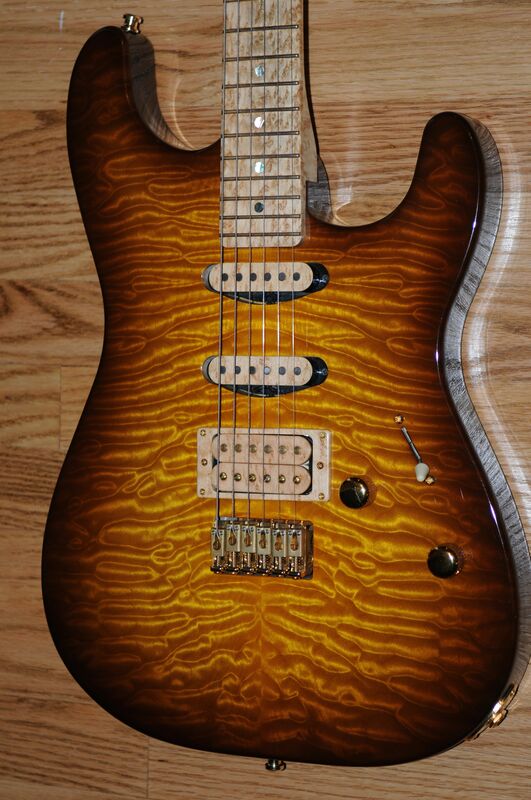 Black Limba & Quilted Maple body. Just 8lbs-4oz. Total One Off Masterpiece! This top is ridiculous at every angle. My My My! What DO we have here! Carved top set neck impossibly rare Thorn Deluxe! Just 7lbs-13oz with Original Case, Tag & Cert. BRAZILIAN BOARD. Monster Top! Comfortable “C” Neck Profile @ .84/.93. 1 Piece Curly Maple TOP! SOLID BODY! 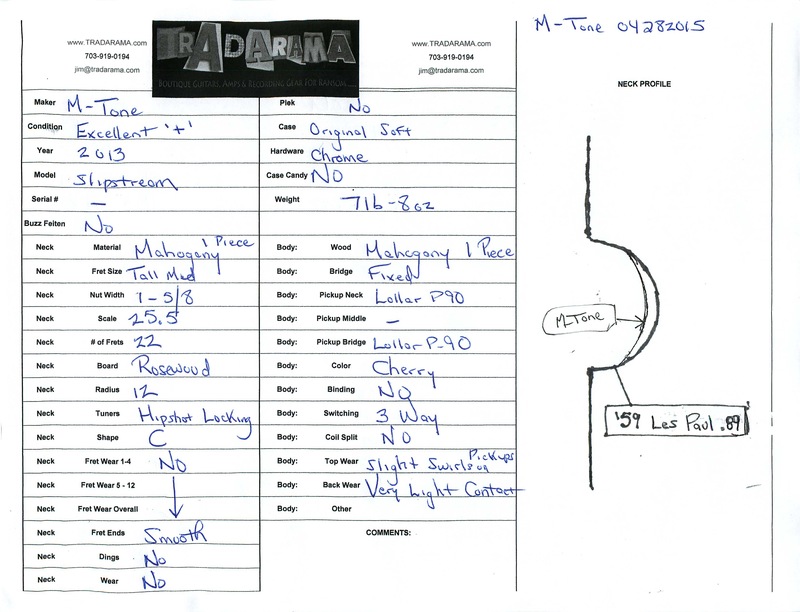 See the pictures for a complete rundown of specs & condition. 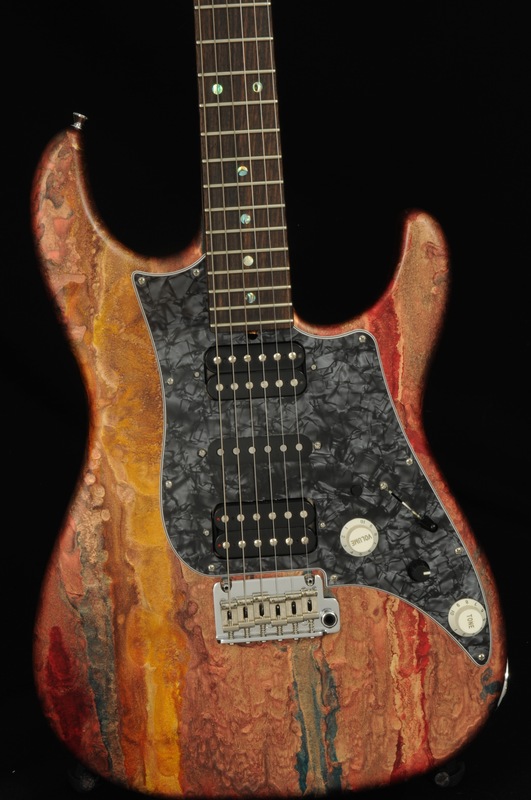 Spalted Woods! Custom Made! Light Weight! Exc Condition! What more do you require sir? 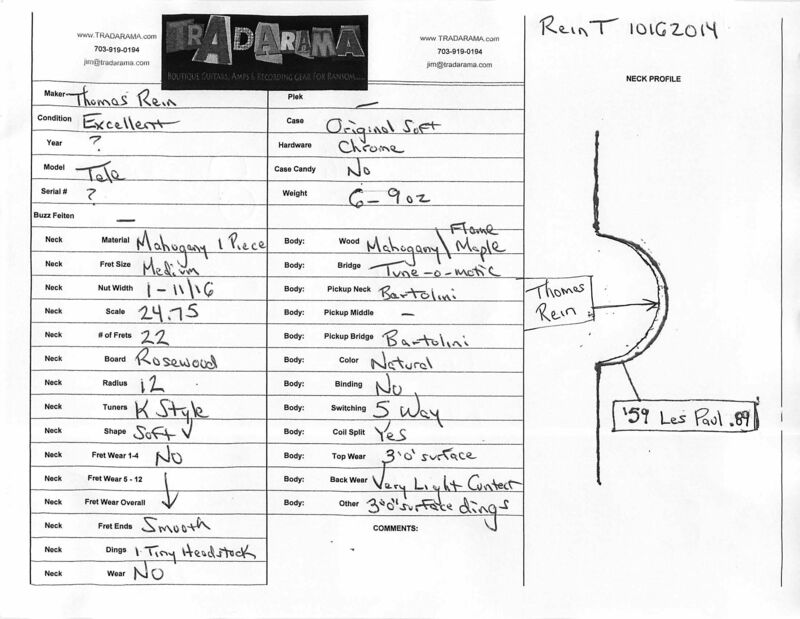 See the spec/condition sheet for all the details your brain can absorb! WOW-type rare. I’ve only held 2 in my hands. 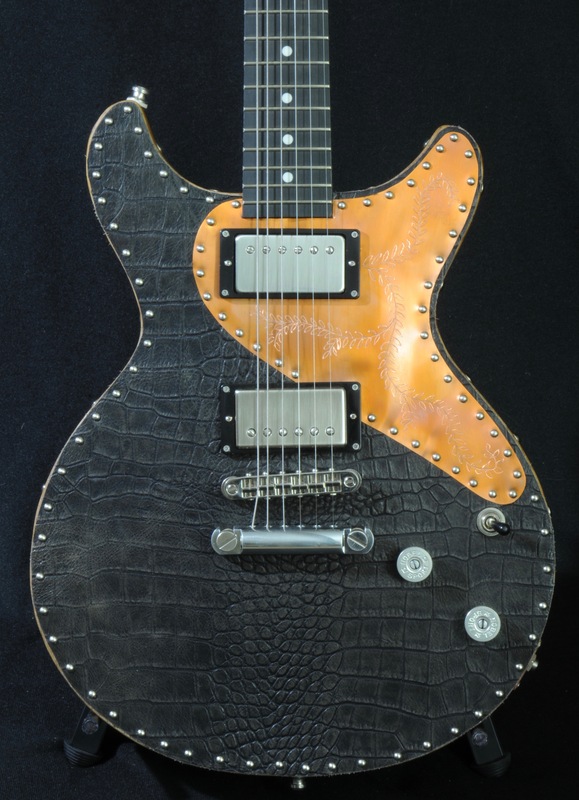 This is a 2000 Terry Rogers “Mallie” made by John Suhr before he was a bigashot (as my grandfather would say). 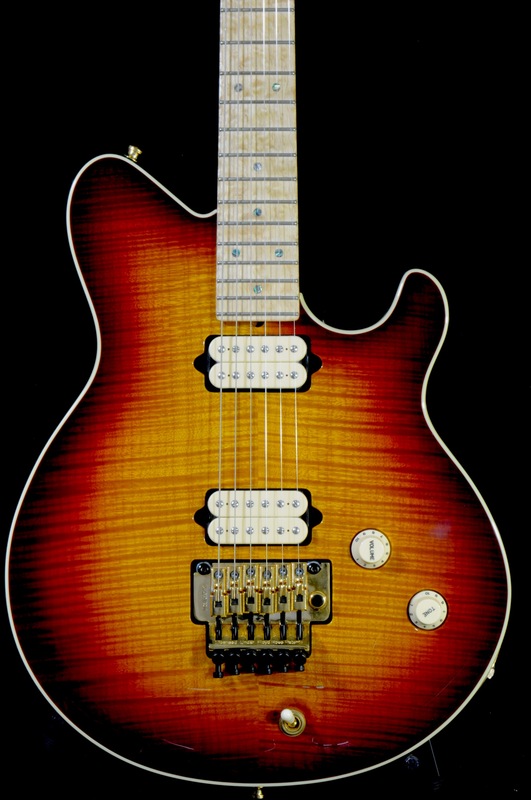 Designed as the “Private Stock” of the EVH world…this guitar features a carved top with a Private Stock grade top. It has museum grade birdseye maple neck woods. Custom neck carve. It is complete with the original case, paperwork and cert. Just never see these for sale. 2008 Taylor GS8 in Excellent Condition w Original Hard Case & Unsigned Warranty Card & Strap. Tiny touch of surface fret wear in the cowboy chord areas that you can only see in the light..not grooves (conspiracy theorists look elsewhere). This instrument does not contain electronics. Just 6lbs-14oz with an Ash Body & Maple Neck. 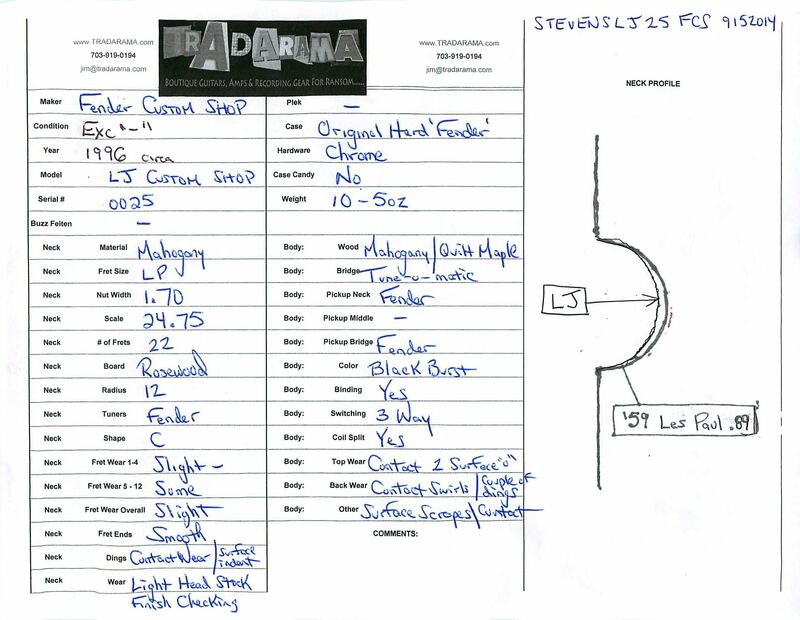 Medium frets and 9.5 radius. Duncan Seth Lover neck pickup & Kelton Swade ’54 bridge. Nonsmoking & original hard case. Why pay $4500 new when you can get this one that many would call Mint and save enough to pay to rename yourself “Kelton”…that is such a cool name…what were my parents thinking?…Jim?…bo-ring….Kelton…that’s a MAN’s name. Avoid the 3+ Year wait and get a Prototype. My personal guitar built to my specs by Mike. Florance Voodoo ’59 Pickups that were swapped into the guitar by my tech to replace the original Lollars. Brazilian RW Board. Just 8lbs-11oz with a top-mounted Skyway trem that is stable like a fixed bridge (and easy to palm) while offering smooth gradual to crazy trem. 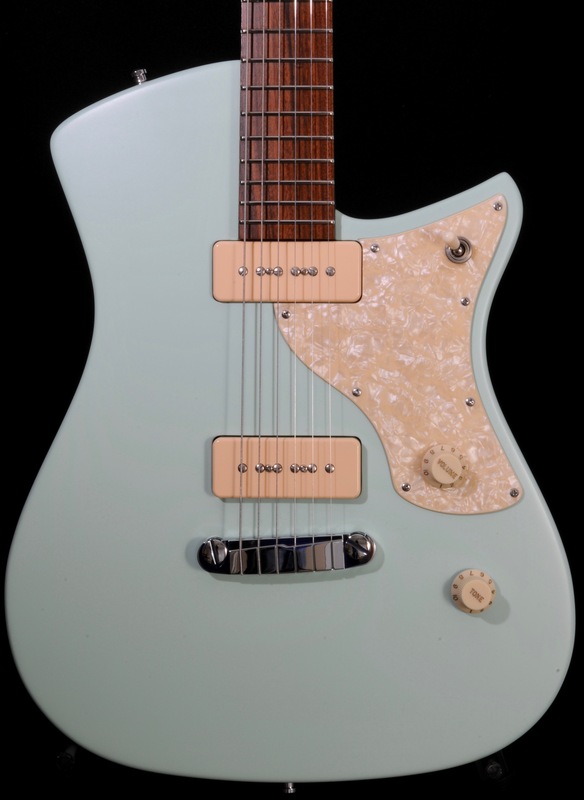 YES…Fender DID make this product. Has a Fender Custom Shop emblem on the back of the headstock. 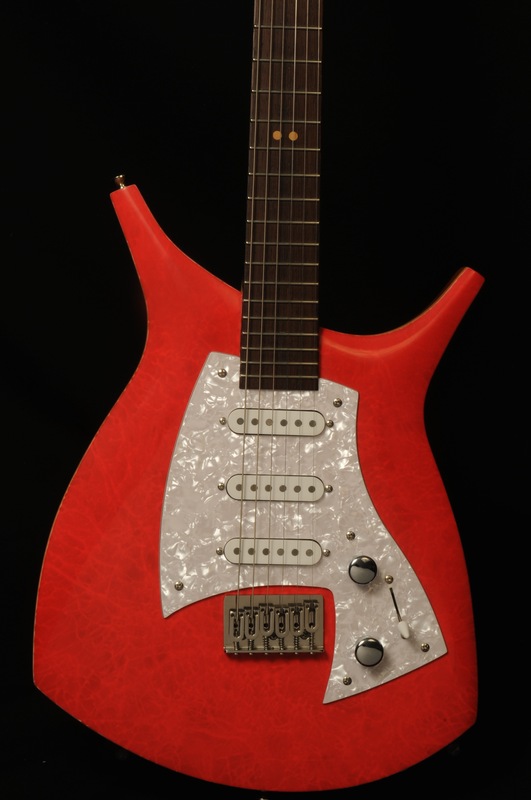 Mike Stevens (www.stevensguitars.com) still makes the LJ (my favorite) and started with this design at Fender when he started the Custom Shop. These are extremely limited production (estimated in the 30s). This is US Made (some were Japan). Think of a LP that doesn’t fart out…a LP with clarity and sustain and beautiful notes. Collectors flock over anything Mike Stevens. 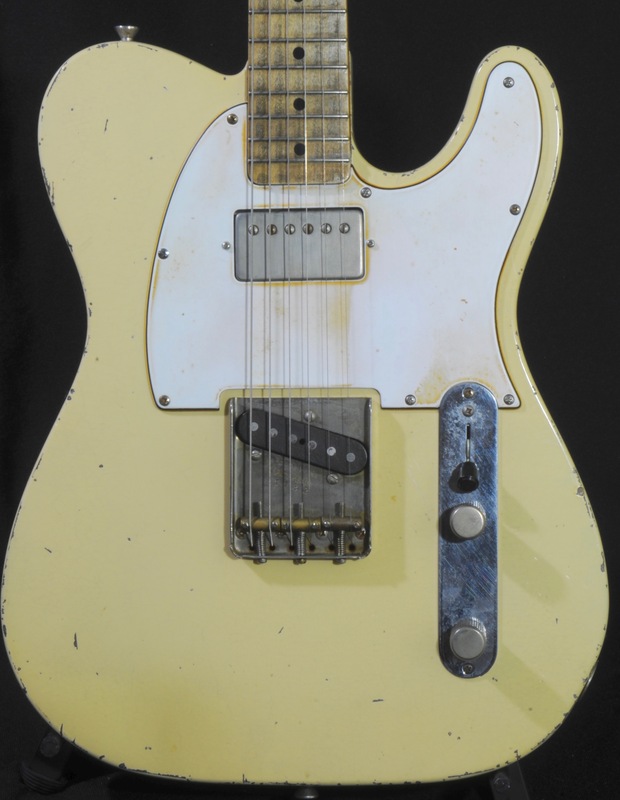 The Fender versions never come up for sale and are hoarded by collectors. Don’t miss this chance to own a piece of history that you can play and enjoy. Hand crafted in Switzerland! Set Neck Mahogany Body & Neck. LIGHT at just 6lbs-9oz. 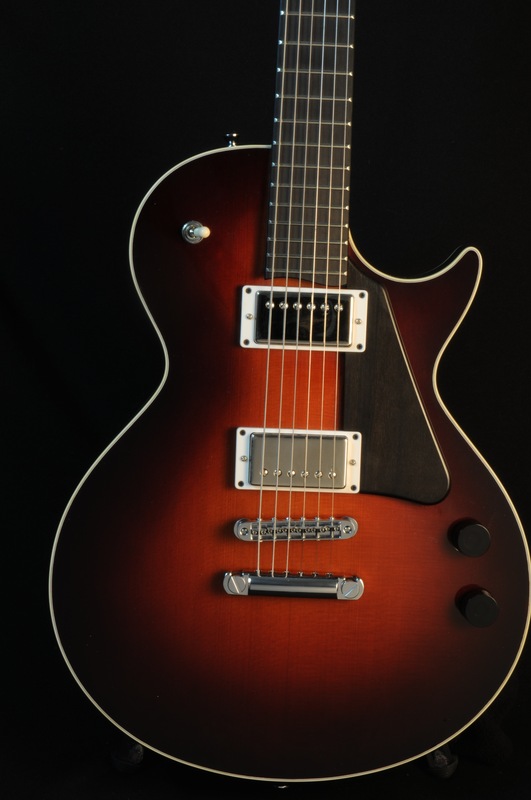 25.5″ Scale for snap but growl of mahogany and P90s. 1.65″ Width and 12 Radius. Beautiful contoured back. Mint green/blue color and pearloid guard make this a show stopper! Feel this one resonate and you’ll be sold too! 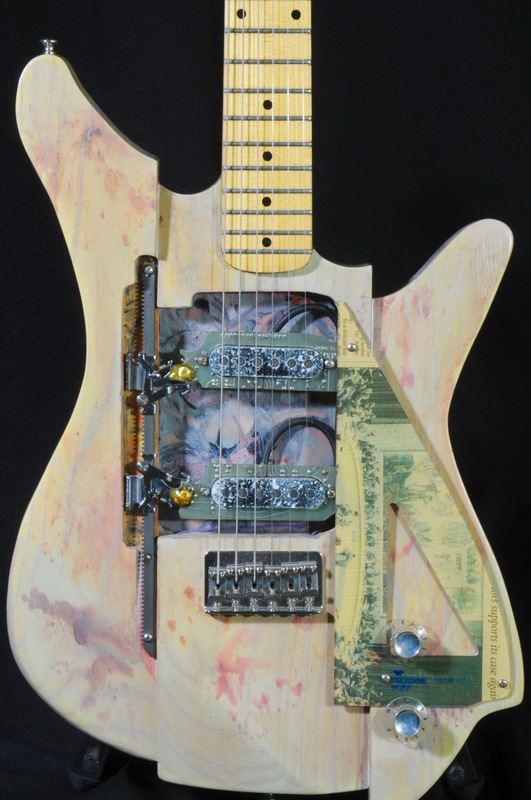 This was a 2015 NAMM guitar. I am an Authorized Dealer! Rare Soloway 27″ Sale Swan. 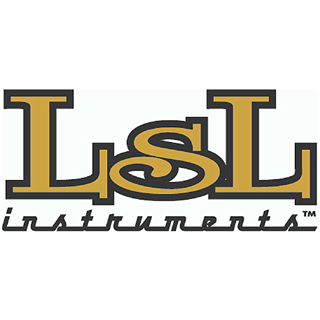 These instruments have haunting sustain and clarity. They are never for sale because owners never part with them. 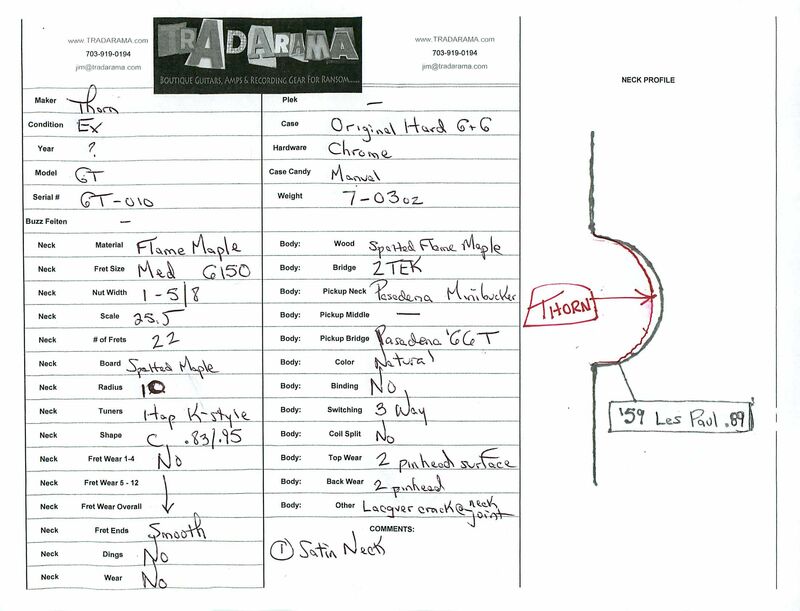 Compare that pedigree with other builders whose guitars flood the used market. Just 6lbs-7oz. 1 Piece Ash Body & 1pc Maple top. 1 Piece Birdseye Maple Neck. 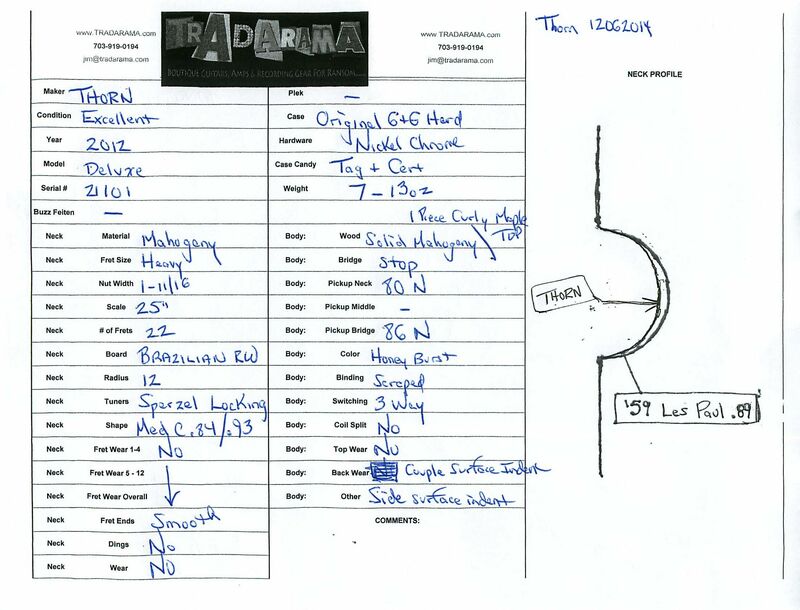 Very light wear described in the spec/condition sheet. Have you seen the YouTube series by Juha Ruokangas regarding his pursuit of the ’59 LP next generation? I was inspired by it…enough to be a stocking dealer for years. New this guitar is in the $8ks with a long wait of about a year. This 2010 Unicorn Classic weighs in at a polite 7lb-14oz and features Spanish Cedar body/neck and a highly figured Arctic birch top. 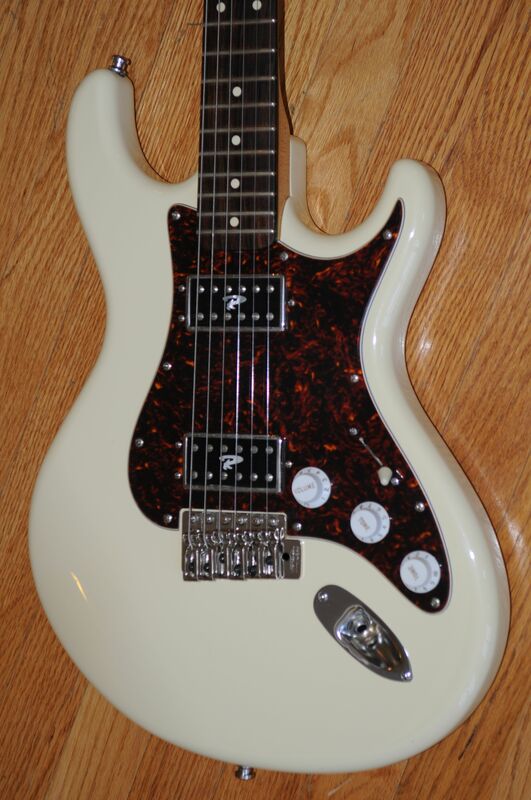 Jumbo Stainless frets and Haussel Pickups (think clear PAF tone). What sets Unicorns apart?…they have a 3D tone found only in the top shelf of instruments. Think overtones along with even sustaining fundamental notes. Nice satin finish and a sonic footprint that will leave you asking ‘where’s the B(-eef) when you listen to a G product. 2003 Ruokangas VSOP Classic. Juha Ruokangas has become one of Europe’s most respected luthiers. Old world craftsmanship and a proprietary process by which they synthetically age woods to simulate the properties of vintage guitars. The result?..sustain, clarity and organic qualities not found in modern production. 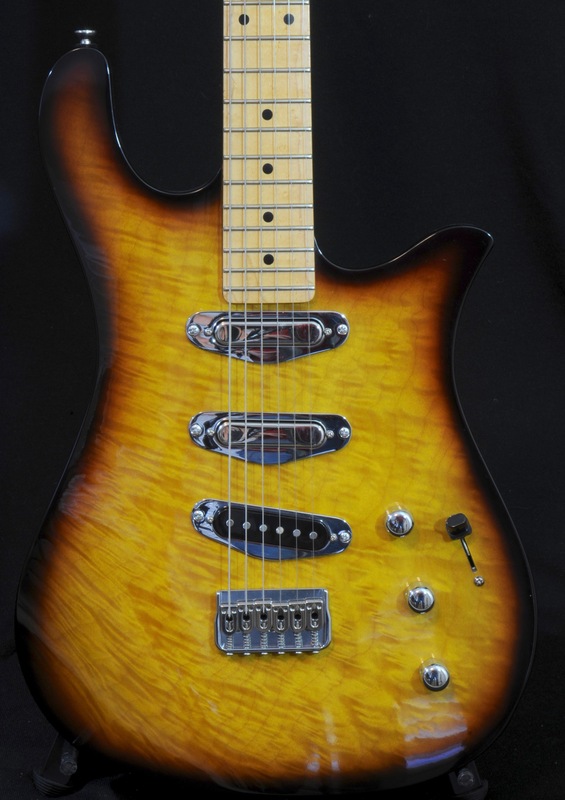 The only issue with Ruokangas Guitars is their price new in the US because of exchange rates, duties and shipping. 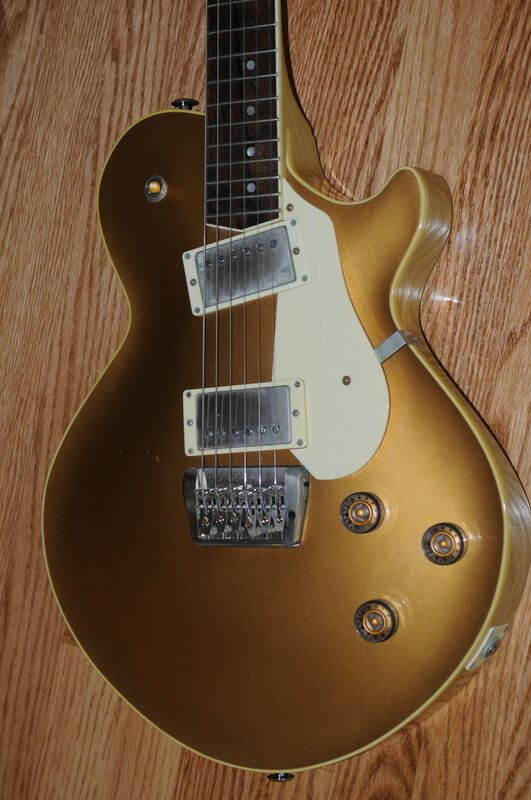 New this guitar is in the mid-$4ks…but used it is less than the wannabes. Treat yourself to a hand crafted one-off rather than a one-of. 2013 Ribbecke Halfling. This was a Mint condition guitar. Somehow in shipping it received some damage to the back. The back has some cracks slightly into the wood. The guitar plays and sounds fantastic. Structurally it sounds refined and elegant. Smooth notes. Clear like an acoustic guitar was married with a LP and 335. 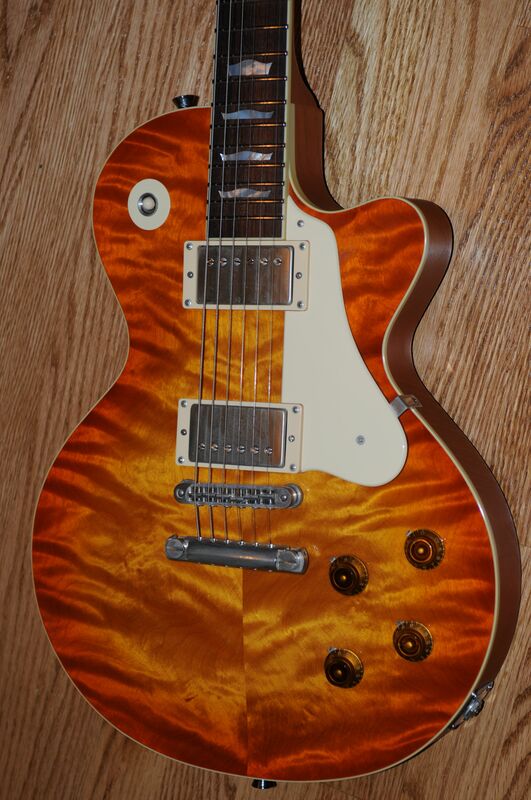 Save a boatload on a guitar you won’t be embarrassed to take out or to place wear on. Chambered Wenge/Western Red Cedar body with Mahogany Neck. Heavy frets and 1.75″ width. Duncan pickups. Just 7lb-5oz. Reunion Blues padded bag. Ebony board and Soft V-to-C neck profile. Read the spec sheet…says “mint -” but that was before the damage so take that into account. 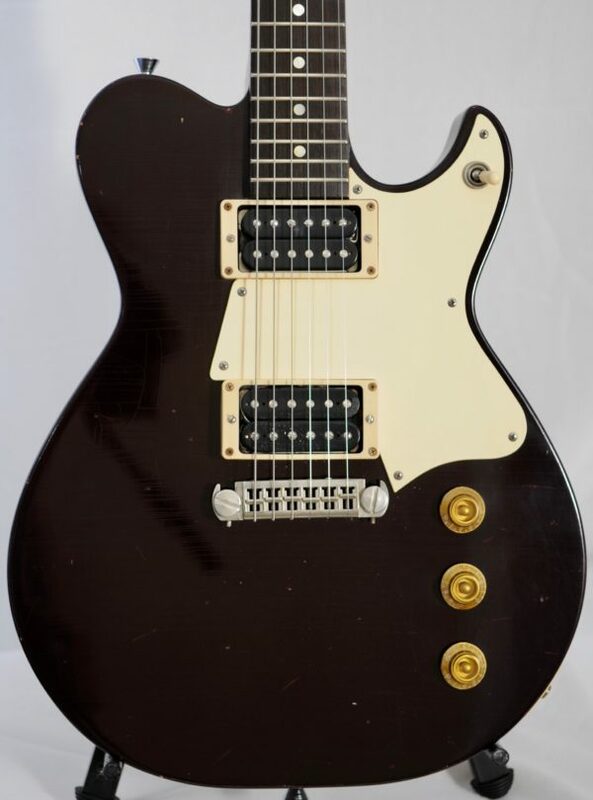 Another guitar that NEVER comes up for sale! 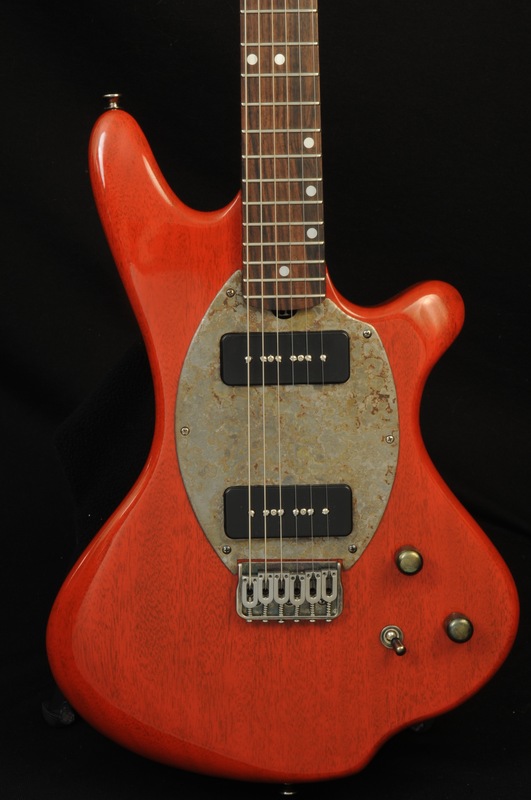 A master acoustic builder makes a rare one-off electric. Why would you purchase a stamped out piece when you can invest in something lovingly hand crafted by someone who builds $10k+ Acoustics and is backordered forever? 1 piece Mahogany Neck. 24.75″ Scale w/ 1-11/16 width. 12 Radius & Medium Frets. Think LP in Tele clothes. Bartolini Pickups. Just 6lbs-9oz! Original soft case. Overall Excellent Condition with no fret wear. See the rest of the specs and condition in the pictures. Sasha Radicic makes world renowned classical and acoustic guitars. His works are cherished and the lead time is lengthy. 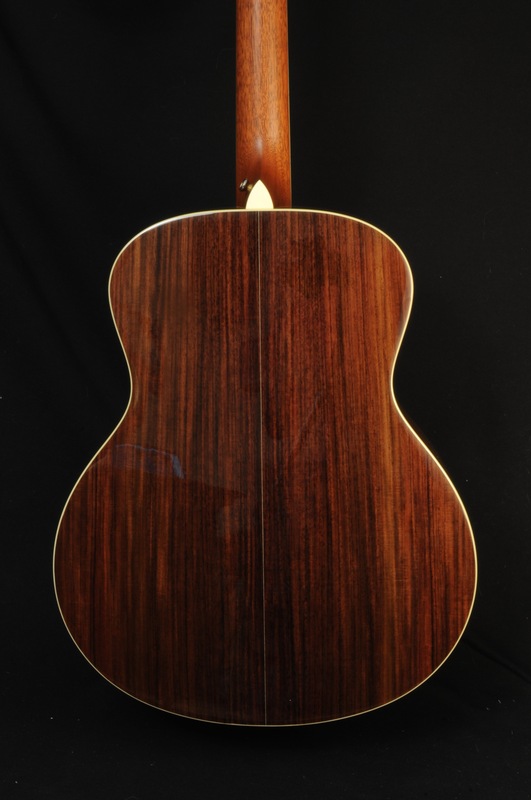 It is said that that the true test of a luthier is their ability to make an acoustic sound beautiful. Take those skills, apply them to a familiar Strat format…use top woods and then you get the most amazing tone at a price you can’t beat. I traffic in the hardest to find gear..and I’ve had the pleasure of playing most of the best. I’d hold this tonally up to the top notch guitars I’ve had the pleasure of playing. It has clear precise even notes, resonance, and overtones. You just don’t get that from the instruments you typically find. Just a masterpiece artistically, tonally and playability-wise (should that be hyphenated?….English majors chime in). CHECK THIS OUT…there is a custom gear thingy with sliders….so you can move each pickup to exactly where you believe it feels or sounds or looks or tastes best. VERY fun guitar to play, look at or taste….if have taste for trans-blondes (she has such pretty blonde hair….why DOES she dye the roots black? )…try that in a bar….works like a charm….Why pay mid-$5ks for a new one when you can have fun with this and have enough money left to pay your lawyer for getting you off when you use my line and get into a brawl. 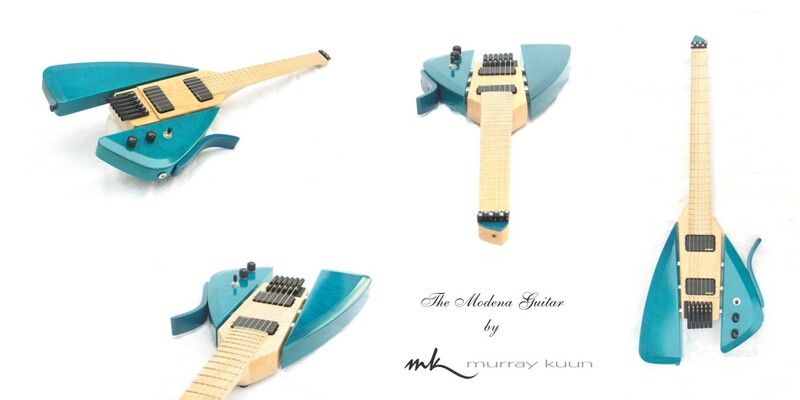 Rare Murray Kuun masterpiece! Exotic woods and artistic yet ergonomic design. EMG pickups and top quality hardware. Amazing tones from a portable, comfortable, stage-worthy instrument that is hand crafted by one of the most respected luthiers on the planet. 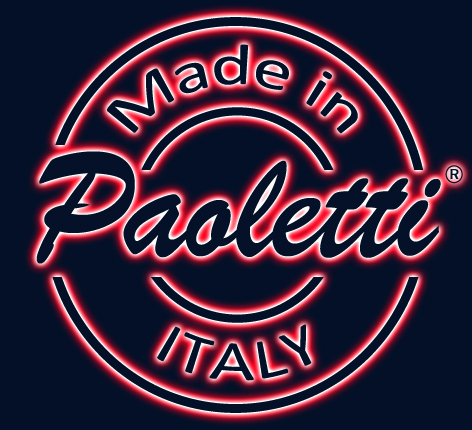 Truly a boutique masterpiece you won’t just find anywhere …..except….. BRAND NEW! Authorized Dealer! Carved Top MONSTER! 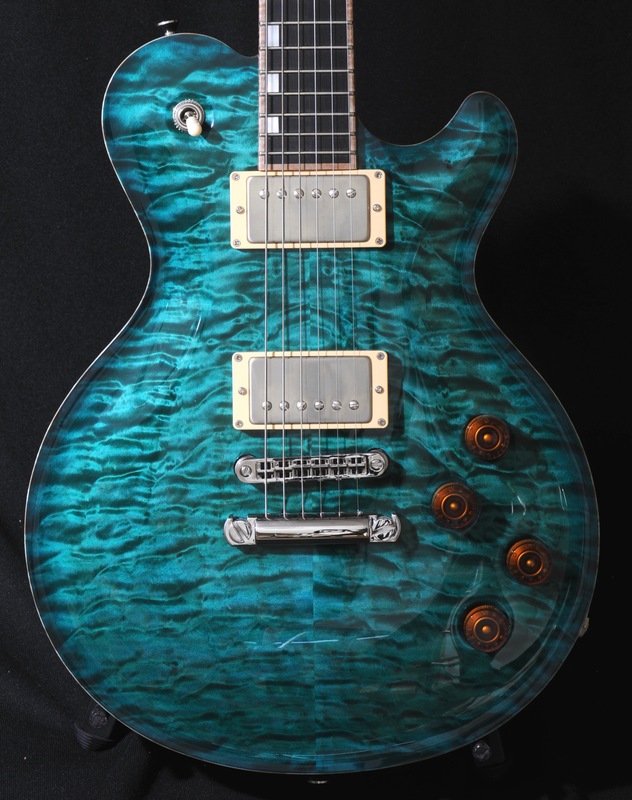 Unreal quilt top & custom color! WCR Pickups! Unplayed! 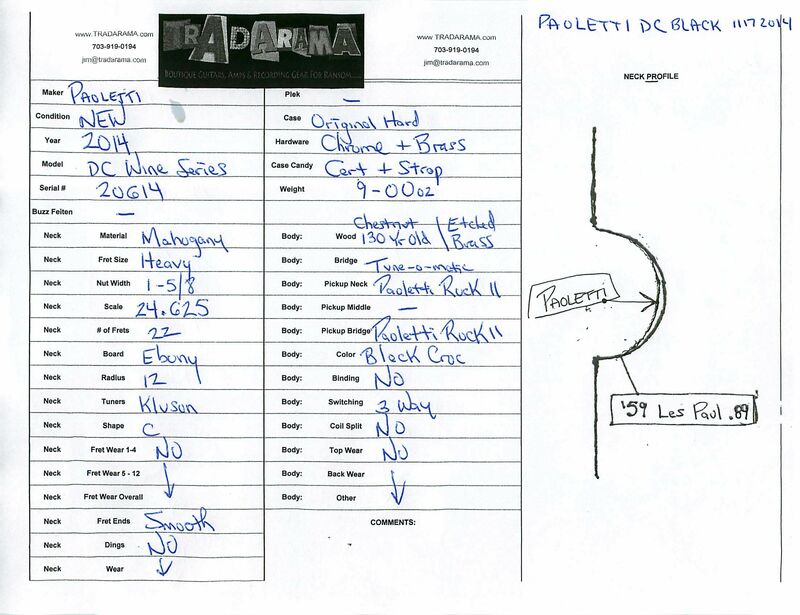 Authorized Dealer! See the pictures for a spec/condtion sheet with all the details! Trades…sure shoot me an email with what you’d offer (and its condition). Brand New (Authorized Dealer)! Monster Quilt Top with WCR Pickups and a Neck Through Construction! Just 7lb-13oz of EVH madness. 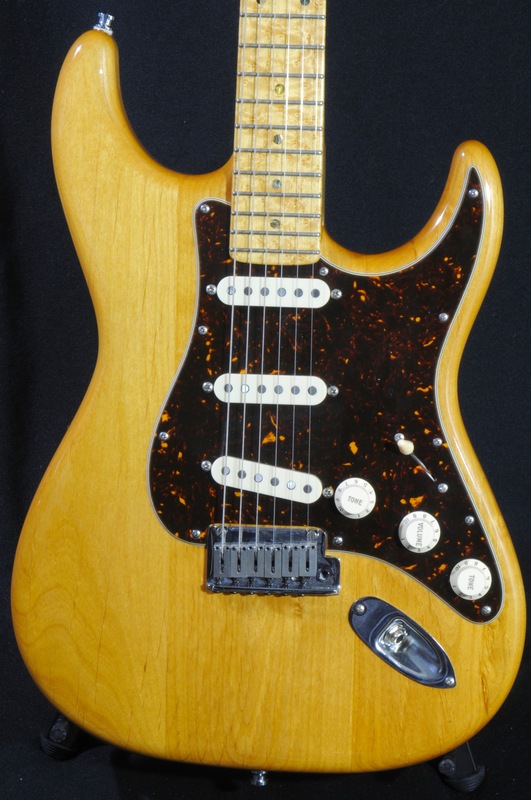 I have always been a fan of the super strat….I custom ordered this to be a “private stock” super strat…and BOY does it deliver! See all the specs and grab this special piece. 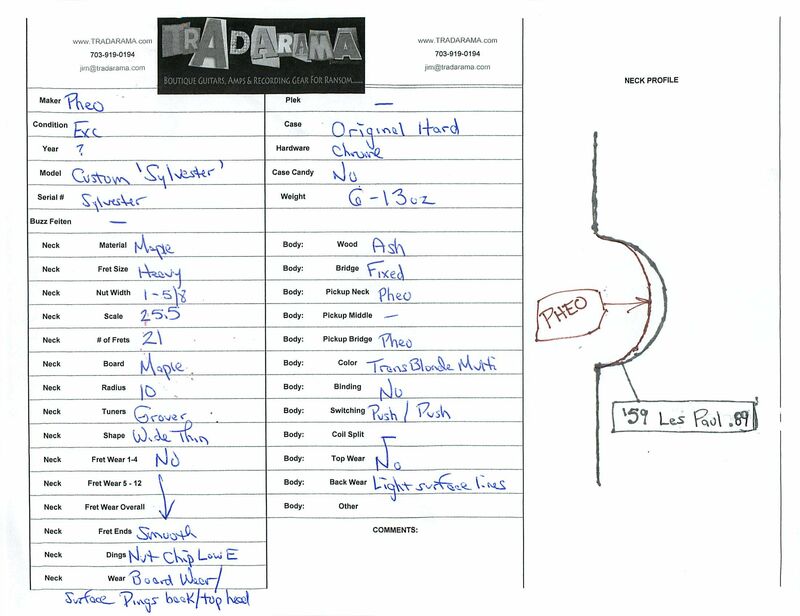 Find a builder who has a Masters in Guitar Building…and artist…a craftsman who spent his life understanding and perfecting his craft….Peter M is that person. 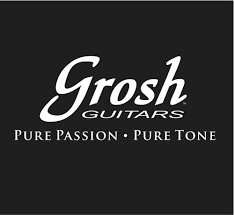 I’ve visited his shop on several occasions and Peter is fascinated with the guitar, tone and the pursuit of perfection at a price point typically reserved for stamped out production rubbish (love that word). 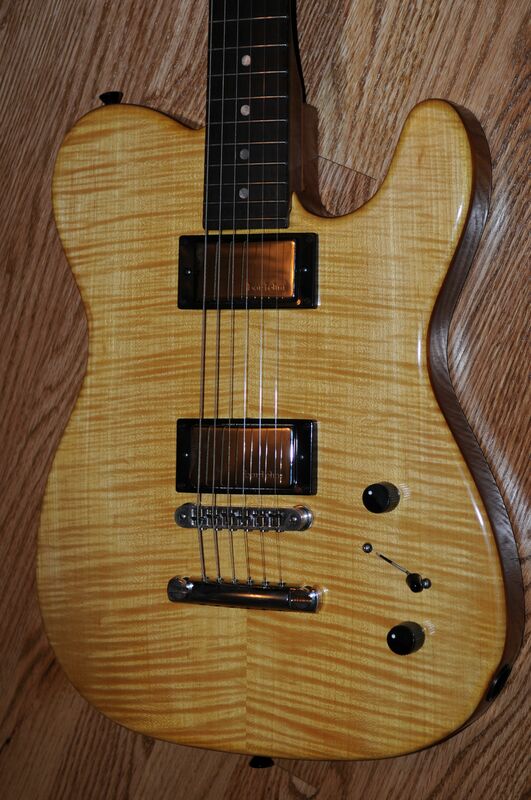 Maple & Spanish Cedar body/neck. Hand wound custom pickups to complement the instrument. Wenge board. Nice Medium V neck profile and 1-11/16″ width. I specialize in boutique and especially love guitars that add something different to your collection…inspire you again…make you feel like you’ve been spinning your wheels. This Malinoski, for $1599, is the cheapest rehab imaginable. If it cost $10k you’d be drooling over it selling kidneys. 2013 M-Tone Slipstream in Excellent + Condition. 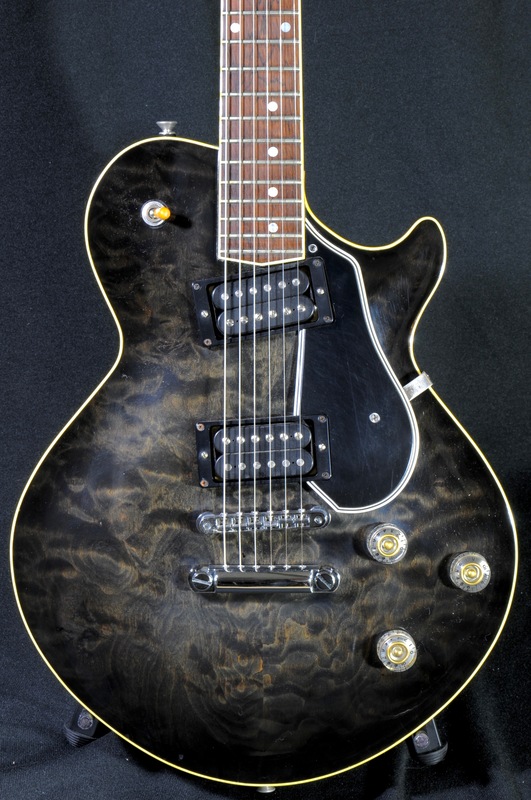 Lollar P90s. Light weight at 7lb-8oz and expertly hand created. Ergonomic and easy to play especially standing up. For the price of a cheap import you can have quality, unique and tone.